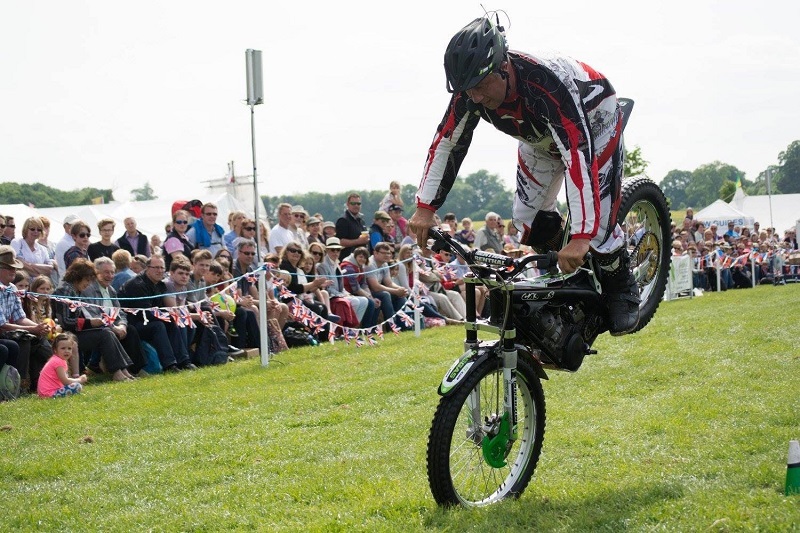 Our interview with Jez Avery, mountain bike stunt legend and all-round showman, one of the originators of freestyle mountain biking and renowned UK stunt show performer. OSTMB: Would you like to write a short introduction, telling us who you are and what you do? I am currently the owner, rider, driver and commentator of Jez Avery Stunt Shows. Facebook: Jez Avery Stunt Shows. Facebook: Jez Avery personal page. OSTMB: How did you first get interested in bikes? OSTMB: What was the first bike you owned? Jez Avery: My first bike at Christmas time 1973 Fairlands East estate, Sunderland Tyne and Wear. I’m sure it was a Raleigh. 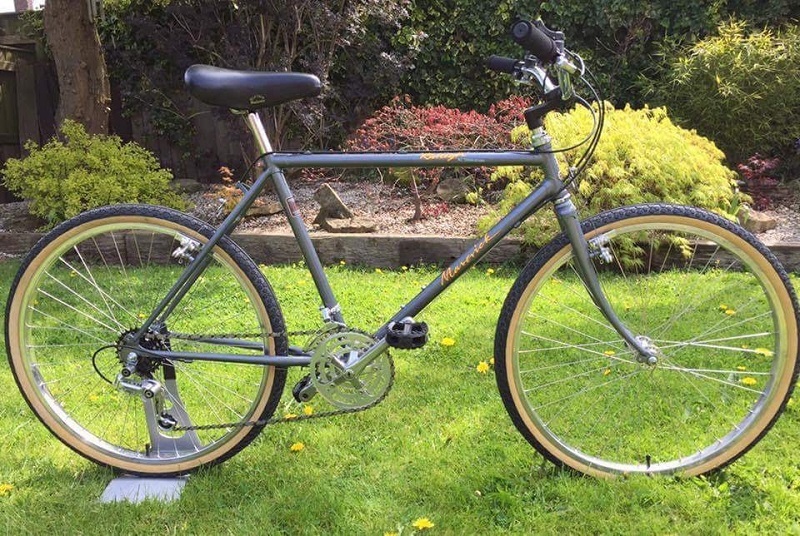 and at 6-7 years old a Raleigh 16″ wheeled bike. I Wasn’t born in the northeast, the whole family moved there in 1971 from Windlesham, Surrey. I was 2 years old, with mum dad and my 2 older sisters. OSTMB: What was your favourite thing about cycling? 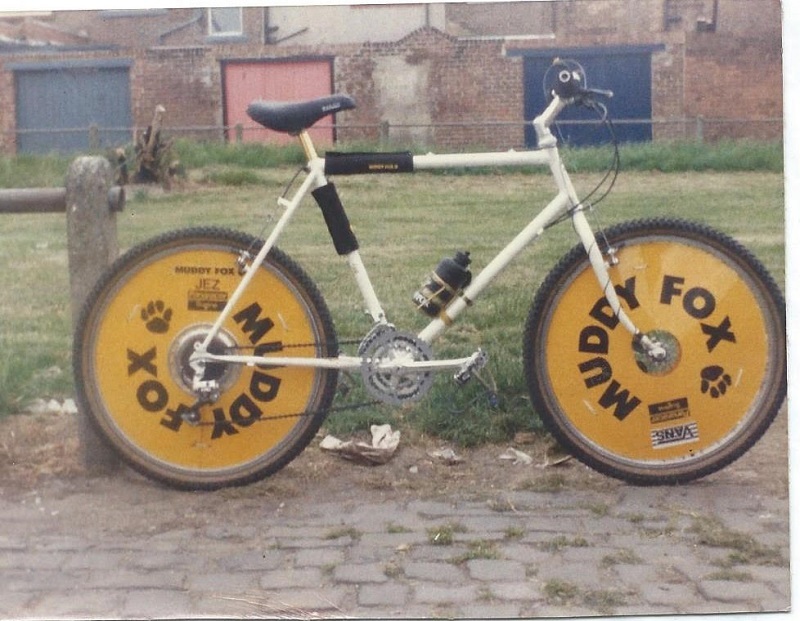 Jez Avery: Cycling got you everywhere, from where we lived in 1972 till I moved away in 1992. 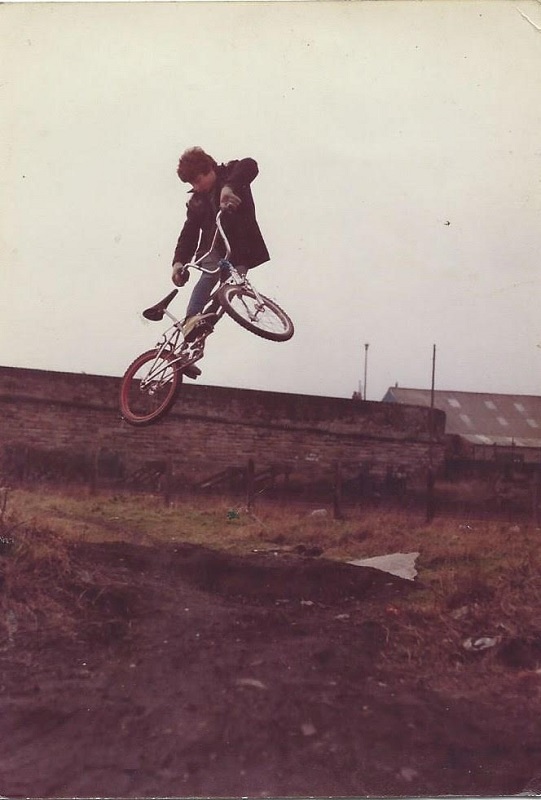 Sunderland has parks, quarry’s and the seaside to ride to and in 1978 onwards BMX tracks were being built all over, within 10 miles of where I lived. Many a time . Friends and myself riding on dual carriageways to Washington, Whitley Bay, Seaham, Durham, and a car ride to Darlingtons BMX scene. OSTMB: Tell us more about riding for MBUK…. Jez Avery: Riding, racing, photo shoots in the UK or abroad. Making the videos and Dirt was the first video. Were Great times. Meeting Andrew Titley and Tom Edwards for the first time. We all got along together..
And Steve Behr, James McCroy and a Steve…..? I think who took the 1st Malvern lake jump photos. These are the only photographers I’ve worked with as memory recalls. OSTMB: JMC was and still is a hero to many of us, tell us a little about him…. Jez Avery: I raced a few times with Jason, we were very equally matched in dual slalom. Both fast out of the gate, and Jason and myself had bmx racing backgrounds. If you rode or raced moto cross or BMX. before riding a ATB it was a great head start to your handling skills on these big wheels bikes… 🙂 I found Jason a friendly competitor and rider and we both put our game face on if we had to ride together, then all friends after the days racing had finished. Many thanks to Jim, his dad who helped me get either my GT UK sponsorship or the MBUK contract by putting my portfolio together in 1996-1998. OSTMB: Looking at videos like Dirt the early UK scene seemed to be a lot less serious than the European and American take on it, is that true? Jez Avery: Dirt Was one of the first. Totally Wild was the first one i think, then Geta Grip. So the Director made it how it is. Not so Serious than other videos. I can tell you this. My bit in Dirt, the Great Ayton Quarry. Jumps and drop offs. I had sprained wrists. There’s a slow-mo bit of me in a face grimacing pain shot. I rode through the pain for the filming. that took half a day… for my fee of £35 fuel expenses, from Mr Crud, Pete Tomkins. Not Hollywood actors or stunt man fees, but all great fun. OSTMB: What was your greatest moment when you were racing? Jez Avery: My Dual Slalom British Championships wins, three Years in a row. 1995-1996-1997, I think. I loved the bunny hop comps, winning all bar one. With Over 45 Flex Stems I had, and sold them at trade to friends and shops..
Meeting John Dight… The man you got me onto Proflex UK, Ultra sport Long Eaton Nottingham 1990-1991 Onwards… and who started my TV and filming years. 1990 till present day, Motormouth, Blue Peter, You-Bet! Also stunt doubling for actors in films, one which went to Cannes Film Festival. OSTMB: Do you still get to hang out with anyone from BITD? Jez Avery: I haven’t hung out with anyone from back in the day. I do keep in touch weekly by phone, to pass the boring truck driving days… The Martin (Team Flaps) Lidgley. And… this face book idea has reconnected nearly all the old riders from back in our day. OSTMB: Do you think mountain bikes succumbed to the trend of more is better, more travel, full sus and does the average rider need it? I wish we had them BITD or, will someone give me the chance of having a few days riding on todays courses. on a top of the range DH Bikes..
OSTMB: Is your garage fulled with retro goodness, or are you a one bike man? 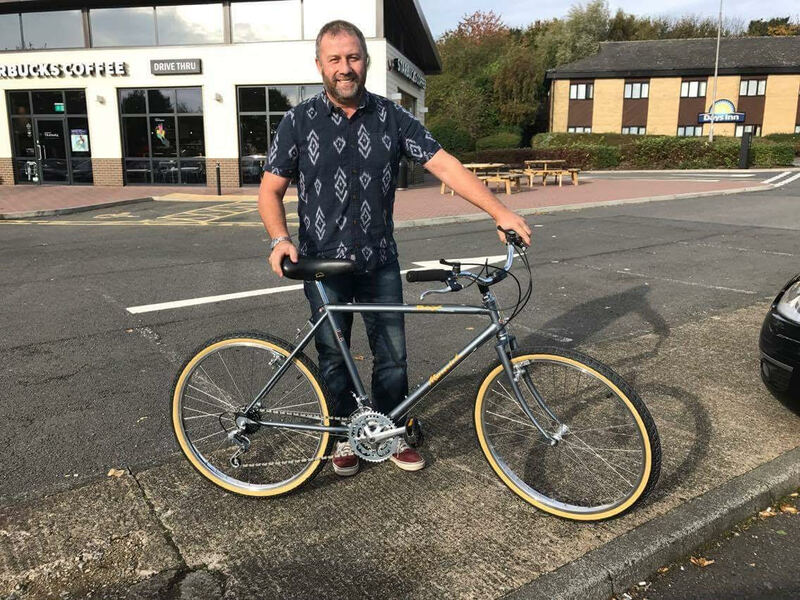 Jez Avery: I’ve bought my First BMX, a 1981 Raliegh Ultra Brner. My 2nd BMX frame and forks, GT PRO Size, and built that bike and my First Mountain bike, a Raliegh Maverick. These are the bikes that honed my wheelies trick riding and jumps. They help me remember my late mum and dad who always supported my riding Career, thats why I’ve bought them again. OSTMB: Do you have a favourite bike? Jez Avery: 2 Favourite bikes were my GT LTS and a Saracen full suspension, can’t remember the name of her. The LTS just jumped, downhilled, everything. The Saracen jumped my way into the Guinness World Record books. Twice. First the MBUK Car Jump Poster 5 cars ramp 2 ramp jump. Then the BBC Record breakers Sept 1998 programme. 6 car jump, 11.9 Metres, with a set run up and pedal power alone. OSTMB: Do you have a favourite mountain bike to date? 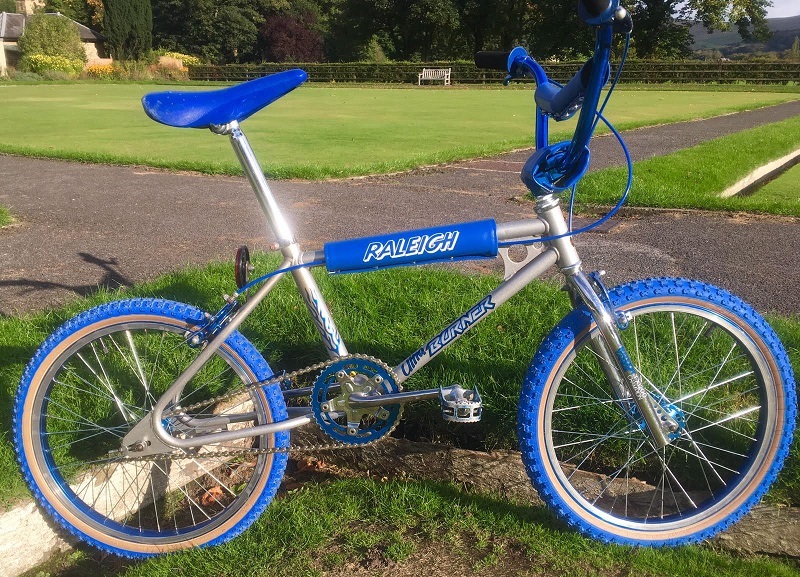 Jez Avery: My just Purchased Maverick, it started my ATB Career… Then the Proflexs, LTS, Saracen, Etc…………………..
OSTMB: And the best bike paintjob? Jez Avery: Denton custom hand built frame and forks, my Proflexs… My Muddy Fox, and I loved the LTS polished alloy frames. OSTMB: How has the world of trials riding changed since you started riding? 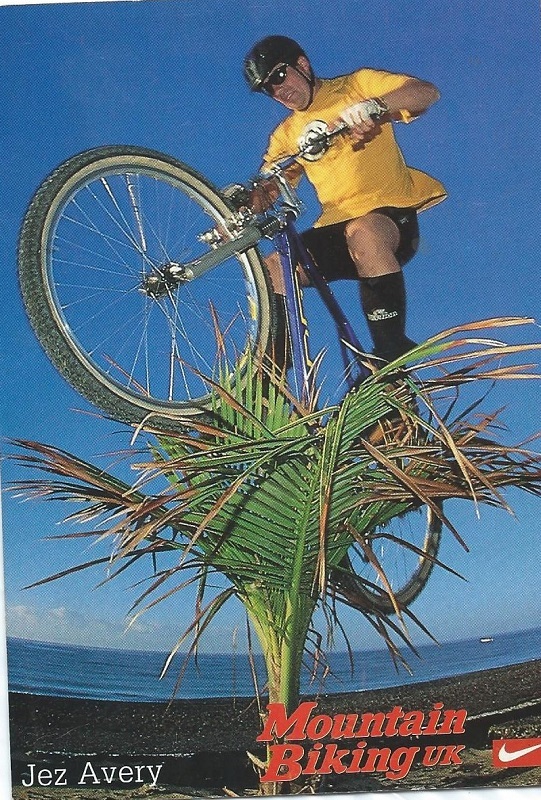 Jez Avery: When I started my Stunt displays in 1996 I rode with M.A.D. mountain bike arial displays. 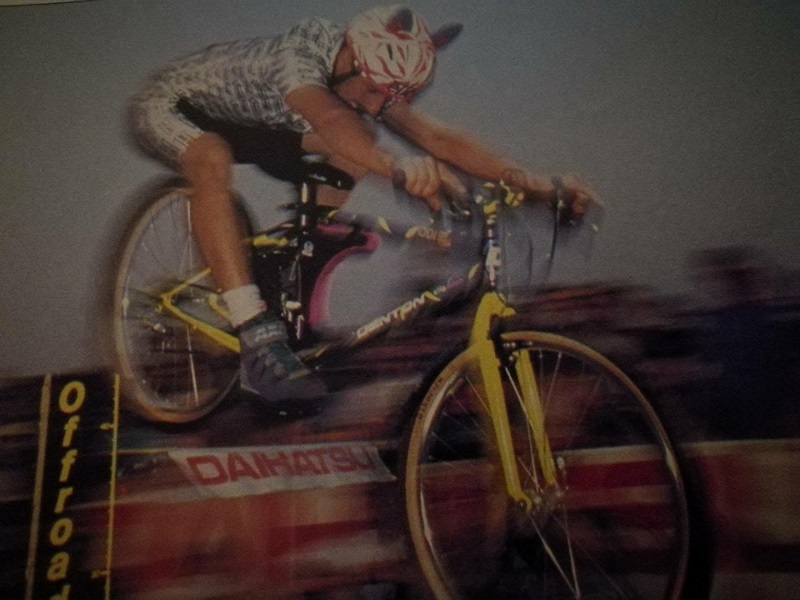 And seeing the changes of trials riding from then to now is truly amazing to me.. I’m Friends with most of the trials teams of today and it makes me smile that they have heard of me still from the end of my racing in 1998…. OSTMB: How did the stunt show start? Jez Avery: In 1998. a few years of riding with other riders at events and for M.A.D. A Promotions friend Graham Albi Alberson had ELITE Promotions, he and I did a few MBUK Pontins Holiday park stunt displays. 1996 – I think with Dave Hemming, Tom Edwards and a few others I think, which were very successful with the audiences. Then Graham and myself set up the Rochdale MBUK poster photo shoot, to try and jump up to 5 cars, one at a time, from ramp to ramp. Under pedal power alone. with a Guinness Record Breakers official watching over the days Event. Every car I jumped set a record.. 🙂 3 weeks later Guinness wanted us to do it again in London and to film it for the BBC, with Linford Christie. After that shows that happened around the UK and further abroad, in the summer time. Wanted me to put on a ATB Stunt show as their Entertainment, and that’s how it All started. OSTMB: Has the friendliness of mountain bikers you meet out there on the trail these days changed or is it us getting old and cynical? OSTMB: How often do you get to ride? Where? And what? OSTMB: Where is the best place in the world you’ve ridden? And why? Jez Avery: The Dirt video location was a big influence on me. Riding around the top edge of the volcano in Fuerteventura, and the places we filmed. Then I got to think of owning a home abroad. OSTMB: What have you been up to recently? Jez Avery: Its October 27th 2016, I’ve just finished a full summer season entertaining around this fine Country of ours. 40 + show events from 25th March till 24th September and promoting my stunt show Display Business at The Showman’s Show, Newbury Showground.. I’m 5 years left to live in Wigan, with my 10 year plan. Since my divorce in 2008.. I set a bar of staying in this area to share and get my daughter though her schooling so she has the Best start after school time. To plan for her to go to university, or collage, or straight into the navy. At 12 years old this year she has just started Sea Cadets. 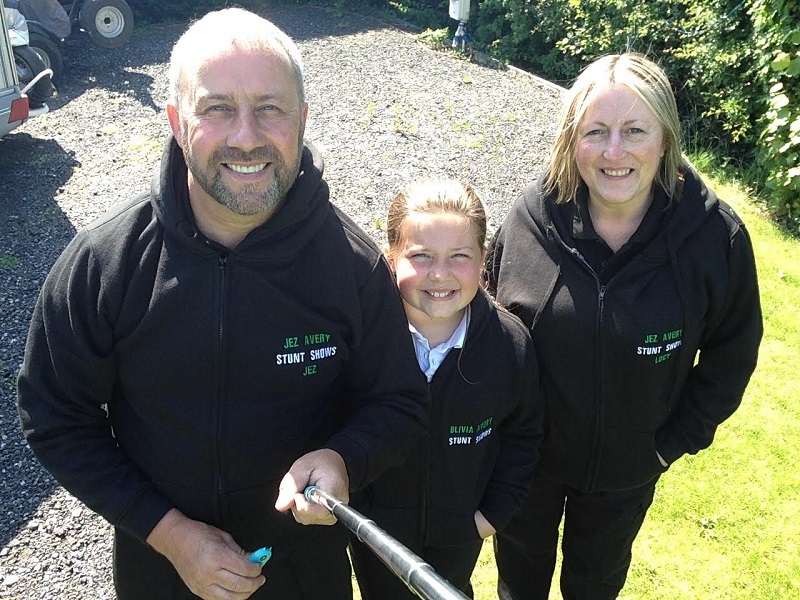 I’m also a very proud dad with everything she has done in our lives so far… Then I plan to move back north to Northumberland, to the Village of Bambrugh…. To my Fiance Lucy Hinson. 🙂 I Love my Work entertaining the audience’s at all kinds of shows anywhere on our blue planet. I Only ride a little bit of mountain bike in both of my stunt displays now, mainly because of a Back Injury from 2011. 2 fractured vertebra and 5 broken ribs during a bad weather show and a bad landing on my Gas Gas trials motorbike. OSTMB: Anything else about yourself or the company you work for you would like to add? Paul HOTPIE Wilson and Graham HOTPIE Mathews are still alive and kicking. It was the 3 of us that were in the Hotpies Team…. If there is a demand for our old school mountain bikers out there to put our heads together and write the book of how we started… Till then I Look forward to the feed back. JEZ HALF MAN, HALF BUNNY. I remember that Christmas morning over Tizicks when that dirt quater pipe jump picture above was taken. Mate your 50 next year and how are your knees ? Good memories. There ok ish. Left ones quite weak now and then. We still need to catch up over this winter time. Blakey. Ok. Jj.